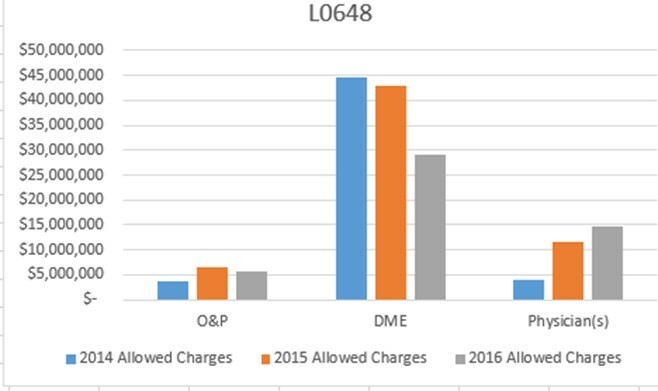 As part of its update to its 2018 work plan, the Department of Health and Human Services Office of Inspector General (OIG) announced that, based on abnormally high utilization and unusually high improper payment rates, two off the shelf (OTS) HCPCS codes that describe lumbar sacral orthoses (L0648 and L0650) and one OTS knee orthosis code (L1833) will be added as an area of focus for investigation by the OIG. All three codes identified by the OIG are part of the split code set created by CMS in 2014 that differentiated OTS orthoses from those that require the expertise of a certified orthotist or an equivalently trained professional. 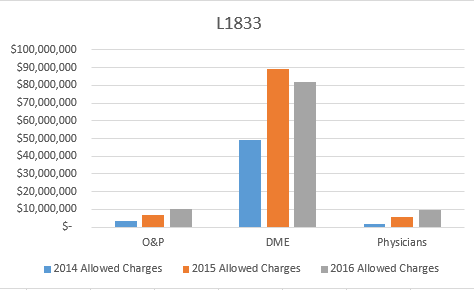 In its announcement the OIG reported that, since 2014, claims for the three OTS codes have grown by 97% with allowed charges rising to $349 million in 2016. The OIG plans to explore questionable billing practices for these three codes including the lack of medical necessity documentation from referring providers and instances where no patient/physician encounter occurred within the 12 months prior to provision of the orthosis. Based on Medicare utilization data from 2014 until 2016 AOPA has determined that less than 10% of the OTS devices described by L0648, L0650, and L1833 were provided by traditional O&P companies. The vast majority of these devices, over 65%, were provided by DME suppliers without certified O&P professionals on staff. 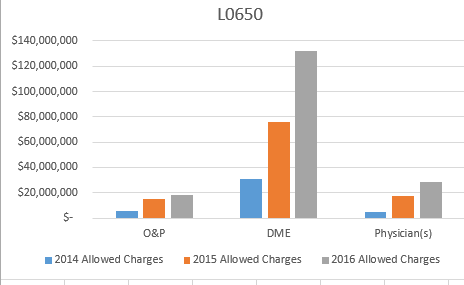 The graphs below show the overall utilization of each code by O&P providers, DME providers, and physicians. While traditional O&P providers represent a small percentage of the overall utilization of these three codes, it remains wise to make sure that, when providing OTS orthoses described by these codes and any other codes, proper medical necessity documentation is maintained by the ordering physician and all Medicare policy requirements have been met. While L0648, L0650, and L1833 have not previously been identified as approved for RAC review, the outcome of the OIG review may possibly lead to additional audit activity by the RAC and other contractors. Questions regarding this issue may be directed to Joe McTernan at jmcternan@aopanet.org or Devon Bernard at dbernard@aopanet.org.